The big battle of the week has been brewing all year: Steve Jobs and Apple versus Adobe and its Flash technology (acquired when it bought Macromedia in 2005). We have seen a few skirmishes in the last months, but now it’s war. Earlier today Jobs posted a 1,700 word missive explaining in extensive detail why Apple does not and will not support Adobe Flash technology. Apple has a long relationship with Adobe. 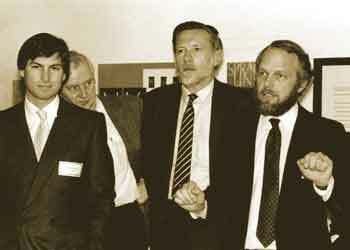 In fact, we met Adobe’s founders when they were in their proverbial garage. Apple was their first big customer, adopting their Postscript language for our new Laserwriter printer. Apple invested in Adobe and owned around 20% of the company for many years. The two companies worked closely together to pioneer desktop publishing and there were many good times. Since that golden era, the companies have grown apart. Apple went through its near death experience, and Adobe was drawn to the corporate market with their Acrobat products. Today the two companies still work together to serve their joint creative customers – Mac users buy around half of Adobe’s Creative Suite products – but beyond that there are few joint interests. The avalanche of media outlets offering their content for Apple’s mobile devices demonstrates that Flash is no longer necessary to watch video or consume any kind of web content. And the 200,000 apps on Apple’s App Store proves that Flash isn’t necessary for tens of thousands of developers to create graphically rich applications, including games. New open standards created in the mobile era, such as HTML5, will win on mobile devices (and PCs too). Perhaps Adobe should focus more on creating great HTML5 tools for the future, and less on criticizing Apple for leaving the past behind. I digress: my point is that there is no shortage of commentary available regarding the controversy, and surprise: some side with Apple, some with Adobe. Of course, Job’s statement is very specific to Flash technology so the search and replace is not seamless, but it does create some funny paragraphs. Apple’s closed products are 100% proprietary. They are only available from Apple, and Apple has sole authority as to their future enhancement, pricing, etc. While Apple’s closed products are widely available, this does not mean they are open, since they are controlled entirely by Apple and available only from Apple. By almost any definition, closed is a closed system. I like that last sentence. Wish I came up with it. While Adobe offers a survey on its site pointing to the “Worldwide Ubiquity of Adobe Flash Player by Version” the sad fact remains that the company makes no money from the free player. Adobe’s revenue source for Flash is software that creates and serves Flash files. Adobe reports Flash-related income as part of its “Platform segment” and in its SEC-filed financial statements for Q1, 2010, Adobe categorizes this segment as “an emerging market with high growth potential.” Yet it delivered only 5.4% of Adobe’s revenue in the quarter. As other segments of Adobe’s business mature (aka stop growing quickly) a lot more is riding on pulling revenue from Flash. I’m counting all the early skirmishes as a single round: stay tuned for Round 3. What is is like to go without media? What if you had to give up your cell phone, iPod, television, car radio, magazines, newspapers and computer (i.e. no texting, no Facebook or IM-ing)? Could you do it? Is it even possible? Well, not really, if you are an American college student today. According to a new ICMPA (International Center for Media & the Public Agenda) study, most college students are not just unwilling, but functionally unable to be without their media links to the world. A class of 200 students at the University of Maryland, College Park, undertook an assignment that asked them to go media-free for 24 hours. THE ASSIGNMENT: This week your assignment is to find a 24-hour period during which you can pledge to give up all use of media: no Internet, no newspapers or magazines, no TV, no cell phones, no iPod, no music or movies, etc. And definitely no Facebook. Although you may need to use the Internet for homework or work, try to pick a time when you can go without using it. This should be an interesting experience for you and examining your own dependencies, so really try to give yourself a chance to do the whole 24 hours. You will write a post about your experiences. Feel free to do some outside research on the effects of Internet or cell phone dependence and share those links with your fellow students. If you do NOT make it the full 24 hours, be honest about it. How long did you make it? What happened? What do you think it means about you? The major conclusion of this study is that the portability of all that media stuff has changed students’ relationship not just to news and information, but to family and friends — it has, in other words, caused them to make different and distinctive social, and arguably moral, decisions. …they cared about what was going on among their friends and families; they cared about what was going on in their community; they even cared about what was going on in the world at large. But most of all they cared about being cut off from that instantaneous flow of information that comes from all sides and does not seemed tied to any single device or application or news outlet. …teens and young adults today place an unprecedented priority on cultivating an almost minute-to-minute connection with friends and family. And the ICMPA study shows that much of that energy is going towards cultivating a digital relationship with people who could be met face-to-face – but oftentimes the digital relationship is the preferred form of contact: it’s fast and it’s controllable. 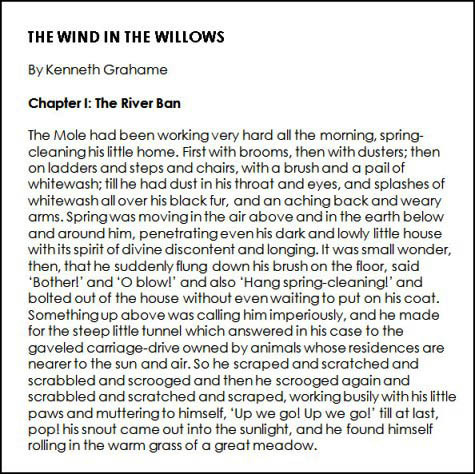 …Students also made it clear that socializing and the flow of information were inextricably intertwined. When the earthquake in Chile struck, most students didn’t learn about it from newspapers or the evening news. They found out about it first through contacts on social networks sites, and that information propelled them to visit mainstream news sites…Information that is not delivered quickly is deemed as obsolete as the delivery method. The conclusions wrap up with specific recommendations for universities, developers of media technologies and for journalists. Perhaps the most intriguing entry explores why most failed to make it through an entire 24-hour span without succumbing to the lure of media. Fascinating and well-presented, I think the big takeaway is that our often-disparaged youth have not abandoned their connections to the “real” world. Instead they have re-evaluated their priorities and are maximizing all available technology to connect more deeply than any preceding generation. Here are year-over-previous-year revenue growth rates for Google’s past seven years. It doesn’t take a mathematician to figure out that Google’s rapid growth is coming to a screeching halt. Then what? Hmm…I guess the game isn’t over. While reading YAP (Yet Another Piece) on what magazines must do to survive the changes in digital technology, radically titled “Magazines Require Innovation, Experiments in Digital and Print” (no, really? 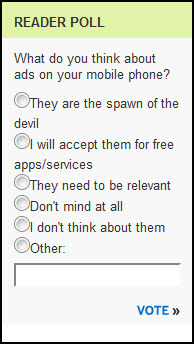 ), I did manage to get a chuckle out of the accompanying online reader poll (scroll to the end of the article). Who would have thought that the digerati wouldn’t welcome the opportunity for one more message from their sponsor? I’ve just rented my forehead to Apple for a year, who outbid Microsoft and Google to place a quite visible tattoo squarely (well, actually somewhat roundly) in the middle. Adobe wanted to attach a Flash player around my neck, but I thought it might get uncomfortable. “Spawn of the Devil,” indeed! I want mobile ads to be both plentiful and rarely relevant, just like most online ads today. And if we’re really lucky, they’ll freeze all useful functionality in the device while we wait for the HTML5 file to finish playing. While researching the preceding blog entry I stumbled on this money-saving tip for the millions of users of desktop printers. Tracking down the source took some detective work. The news originated on the Printer.com blog. Then Diane Blohowiak, coordinator of information-technology user support at the University of Wisconsin-Green Bay, began testing Printer.com’s claim. Wisconsin Public Radio interviewed Blohowiak, and the Associated Press circulated a short account of the interview on March 25th this year. Associated Press reporter Dinesh Ramde kept after the story and on April 6th this week reported that Blohowiak now expects the university to save 5-10% of it’s $100,000/year budget for ink and toner cartridges. According to a Google search roughly 400 newspapers reprinted Ramde’s thorough reporting since April 6th. The detail would sound like mumbo jumbo to anyone not involved in desktop printing, but here’s the scoop. For test purposes Printer.com chose Arial. As shown in the chart above, if you switch to Century Gothic, printing costs would drop by 31%. Printer.com calculates that an individual could save a whole $20/year; a small business perhaps $80 a year. Diane Blohowiak has calculated that a major educational institution can save a whole lot more. 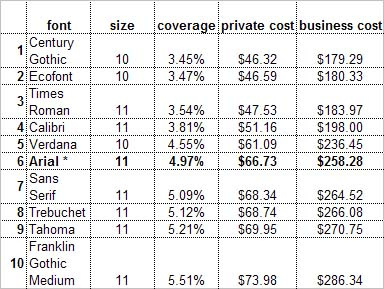 On the other hand, if you, your staff or students suddenly fall in love with Franklin Gothic Medium, costs could rise by a full 11% over Arial. Ah I can hear you thinking: what’s the catch? Alas there are two. As reported in the second AP account, renowned type expert Allan Haley, director of Words & Letters at Monotype Imaging, points out that Century Gothic was designed for titles and headlines, not for full text documents. He still recommends Times New Roman or Arial for their readability. Problem two is even more perplexing. The design of most letters in Century Gothic, because it’s a headline font, are broader than text fonts, and the same number of letters are going to use more paper when printed with this face. None of the reports state how much more paper. Tiring. But go back to the chart. Times Roman offers a 29% savings over Arial, a mere 2% less than the problematic Century Gothic. Problem solved. And now the punch line. Printer.com published its original research results on April 13th, 2009! The firm’s headquarters is in The Netherlands and so the data didn’t filter to the U.S. press until it could find a homegrown spin. The direct result: lots of ink and toner unnecessarily wasted in the past year while we avoided the challenge of reading long laser-printed reports set in Century Gothic.